The Dual Arm Clamp-On Monitor Mount / Monitor Arm will lift your monitors to your perfect ergonomic height. 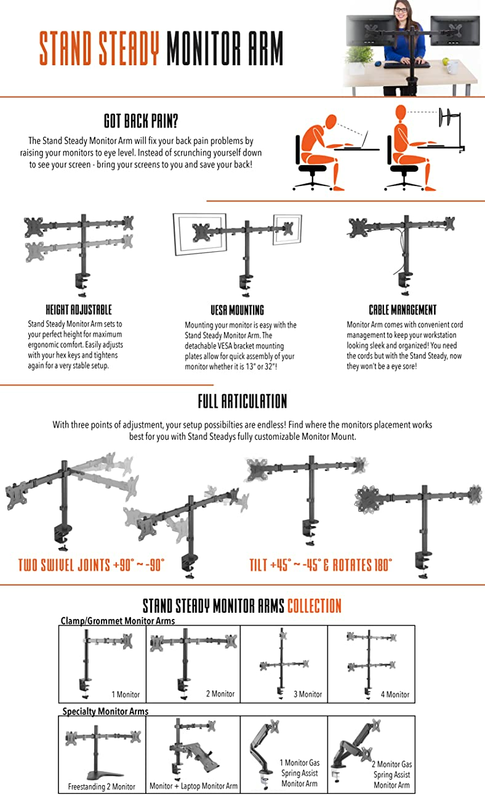 In addition, the ability to twist and rotate your monitors will make your ideal set up possible in just minutes. Say hello to working smarter – not harder. AND say goodbye to any neck or back pain! The Stand Steady Dual Arm Clamp-On Monitor Stand will give you endless possibilities to turn and flip your screens in a way that best suits YOU! GET RID OF BACK + NECK PAIN: Set your screens to your correct ergonomic height, distance, and tilt. With its extra-long column - you can adjust your monitor height anywhere up to 35 inches! FITS MOST MONITORS & DESKS: The Stand Steady Monitor Mount will work great on practically any standard office desk with a rear edge up to 3.46 inches thick or grommet hole. It will fit two monitors up to 32 inches in size and up to 17.6 lbs per monitor. SWIVEL & ROTATE: With your swivel monitor mount, enjoy full motion articulation, swivel +90° & -90°, rotate +180° & - 180°, and tilt +45° & - 45°, along with height adjustments on the center of the column. EASY TO INSTALL: With easy to use quick release VESA mount, you can install your monitors in seconds! Before buying, make sure your monitors are VESA compatible! Look at the back of your monitor: If your monitors have four holes in a square shape - you're good to go! BONUS CABLE MANAGEMENT: The monitor stand offers handy cable clips on the arms and center pole to keep your cords in place and your workstation organized! I absolutely love my Corner Standing Desk!!! I work long hours on my computers and being able to stand up helps my back, shoulders, and neck. I feel better and the long hours at work isn't as bad. Perfect... The corner of my desk has an existing grommet and this product gave me the option for this type of mount. Thank you!! Relatively easy for one person to install, but may require two people to make adjustments once the monitors are attached. I installed 2 LG 32MA70HY monitors and holding up pretty well, so far. Make sure to tighten or else the monitors might slowly tilt forward. Overall good value. This is the second one of these we have purchased for our office desks. The guys love it!! Easy to assemble and works great!! Works great as long as you don't touch it. Screens shake if touched. I've had it in my office for few weeks now, haven't had any issues. Planning on getting another one.